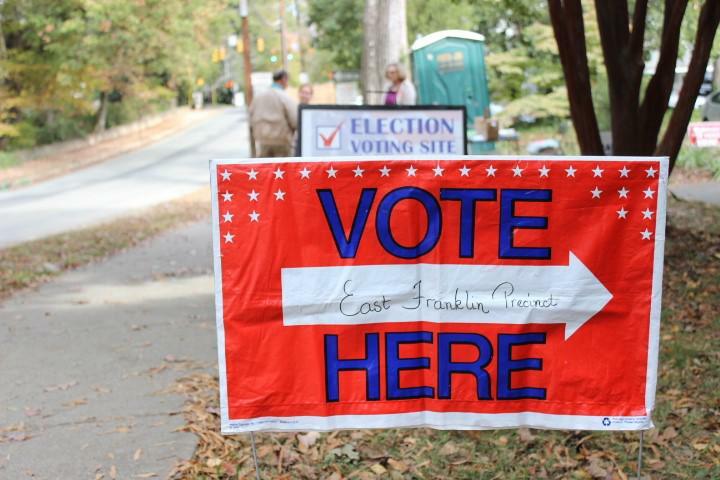 File photo of a voting here sign in Chapel Hill in 2016. A new North Carolina elections board expected to try and resolve the nation's last unsettled congressional race is now in place. Democratic Gov. Roy Cooper appointed the reconstituted board's five members Thursday from nominees offered by the two major political parties. Three are Democrats and two are Republicans, in keeping with tradition that the governor's party gets the majority of seats. In a statement, the board said the panel should meet in February to consider evidence in the 9th Congressional District election, with board members setting a specific date next week. The previous board refused to certify the November results because of alleged absentee ballot irregularities. Republican Mark Harris leads Democrat Dan McCready by 905 votes. The new board could declare a winner or order a new election. The focus of the investigation by board staff has been on a Bladen County political worker who worked to support Harris' campaign and was hired at the candidate's insistence. The new board includes three former state board members, two of whom served on the most recent board. That nine-member panel was terminated in late December because judges ruled it was unconstitutional, the result of a two-year-long fight between Cooper and Republican leaders at the General Assembly over the board's partisan composition and who chose members. The dissolution meant there was no board in place to act for more than a month because the law creating the replacement board didn't start until Thursday. Harris tried unsuccessfully to get a judge to order the board's executive director to certify the race results during that gap. The new board met briefly later Thursday by phone and elected Charlotte attorney Bob Cordle as chairman. He served on the board for several years until 2013. Other Democratic members are recent board member Stella Anderson of Boone and Durham lawyer Jeff Carmon. The appointed Republicans are recent board member Ken Raymond of Winston-Salem and David Black, a Concord business executive. State law requires that while three "yes" votes would be needed to certify Harris the winner, ordering a new election would require four votes, meaning some bipartisanship. Democrats now running the U.S. House of Representatives, which is the ultimate judge of its membership, have suggested they may examine the race no matter what the elections board does. Laws over the past two years had combined the duties of election administration with government ethics enforcement in one board. The law finalized last month again separated those duties, as it had been for decades. The legislature began Thursday the process of appointing four members of the newly-constituted State Ethics Commission. A bill clearing a Senate committee would appoint three former legislators — including ex-House Speaker Carl Stewart Jr. — and former university administrator Clarence Newsome. Cooper gets to appoint another four. State Republican lawmakers are pushing a bill to re-constitute the state elections and ethics boards, again. After Democrat Roy Cooper won the governor's race in 2017, the General Assembly's GOP leadership changed the law to combine the elections and ethics boards and assume more control over appointing members. Changes made to North Carolina's elections board over the last year were unconstitutional, but the board can remain in place through the November elections, a three-judge panel ruled Tuesday.